In the heat of the 2012 US presidential elections featuring Mormon candidate Mitt Romney, the BBC interviewed church spokesman Michael Purdy about the Strengthening Church Members Committee. Purdy’s first reaction was to deny any knowledge of such a committee. When pressed by journalist John Sweeney, however, he admitted it existed after all but pretended to know very little about it. Purdy’s body language – no eye contact, blushing, stammering – as well as the fact that his first instinct was to lie about it, indicate he was not at ease with this question. Why not? What is the Strengthening Church Members Committee? The Strengthening Church Members Commitee was established in the mid-1980s for the purpose of “maintaining files on every member of the church regarded as critical of LDS policies or as too liberal”. Its “total number of staff members and operatives is unknown” (Quinn 1997, p. 311). In a most peculiar 1992 statement, the First Presidency dismissed the existence of “so-called secret Church committees and files” as “false accusations” but then proceeded to explain the purpose of the committee in non-descriptive terms: “as a resource to priesthood leaders throughout the world who may desire assistance on a wide variety of topics” (Church Defends Keeping Files on Members 1992). 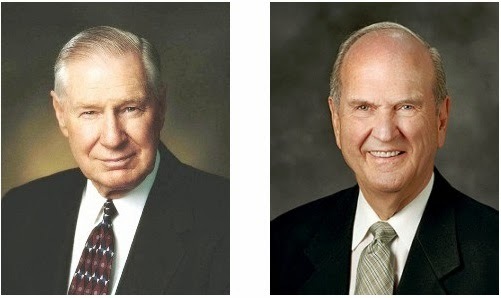 The First Presidency referred to the Strengthening Church Members Commitee as “a General Authority committee” and named apostles James Faust and Russell Nelson as members at that time. They insisted that committee members “neither impose nor direct Church disciplinary action”. In an authoritarian leadership culture like the Mormon church, however, it is hard to see how receiving incriminating files from a central intelligence gathering committee of General Authorities can be perceived as anything but a directive to take action. According to apostle Dallin Oaks, the Strengthening Church Members Committee is a “clipping service” which “pores over newspapers and other publications and identifies members accused of crimes, preaching false doctrine, criticizing leadership or other problems. That information is forwarded on to the person’s bishop or stake president, who is charged with helping them overcome problems and stay active in the church” (Six Intellectuals Disciplined for Apostacy 1993). The Strengthening Church Members Committee has also been known to make recordings of presentations by church members in public forums and in university classrooms throughout Utah (Quinn 1997, pp. 310-311). In principle, then, any Mormon who publicly expresses an opinion on Mormon doctrine, leadership or behavioural standards, is a target. 1. Having unorthodox ideas as such is not grounds for suspicion but voicing or publishing them is. This not only applies to expressions in the church but also outside the church. Mormon church leaders do not tolerate any criticism by anyone at any time. 2. As soon as a member publicly expresses a unwelcome opinion or idea, a file is opened and the incriminating statements and/or publications are entered into it. These are reviewed and offending passages are marked. 3. The file is forwarded to the suspected intellectual’s local church leaders with the instruction to confront the member with it. These instructions are kept vague as the Mormon church’s disciplinary procedures are supposed to be initiated bottom-up, not top-down (Handbook 1: Stake Presidents and Bishops 2010, pp. 53-54). 4. Whatever happens next, therefore, largely depends on the local leadership. Regardless, finding out your church monitors you this way is an intimidating and sobering experience according to those who have been through it. 5. In many cases, an interview with a local church leader is the end of it, especially if the accused expresses their loyalty to the church and its leaders, and agrees to keep a low profile. 6. However, if the person does not agree to be silenced, harsher measures follow. What these measures are, depends on the influence the Mormon church wields over the person (e.g. termination of employment) and what church leaders think they can get away with without creating too much of a media spectacle. What does this mean for Mormons today? Though described as a mere clipping service in 1993, the files of the Strengthening Church Members Committee are much more comprehensive than this seemingly harmless term suggests. A single critical sentence is enough to start a file. “As a glimpse into the extent of these files, a history professor at the Utah State University was informed during a meeting at LDS headquarters in 1990 that his surveillance file contained an anti-war statement he made as an undergraduate student in college”. The committee “also receives surveillance reports and other information about LDS members from the Correlation Department, Public Affairs Department, Church Security Department, security officers of ZCMI department store [now redeveloped into the City Creek Center], and from BYU’s security” (Quinn 1997, p. 311). website looks like when they forget to cover their tracks. Given this history, it stands to reason that today, the Strengthening Church Members Committee also monitors the internet for Mormons voicing dissenting opinions. 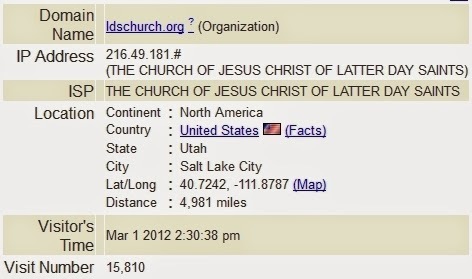 Mormons with websites, blogs or social media accounts are therefore likely to be monitored by their church. They may not believe it but it’s a testable hypothesis.